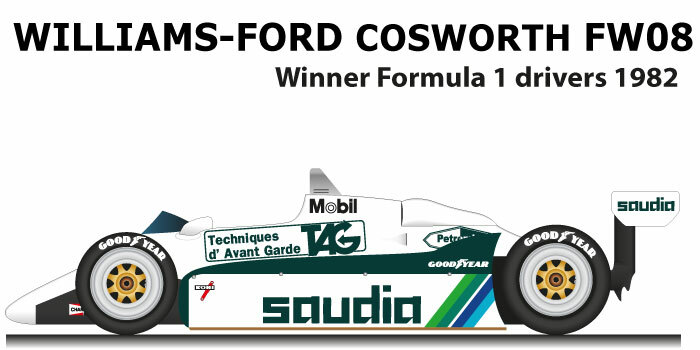 Williams – Ford Cosworth FW08 n.6, and the 1982 Formula One World Championship winning car. Team manager Frank Williams after the 1981 World Cup defeat with Williams FW07C, commissioned the project to Patrick Head and Frank Dernie they make a car that is not very innovative but very reliable. Keke Rosberg with Williams – Ford Cosworth FW08 n.6 won the Formula 1 World Championship in 1982, for the Finnish driver was the first and only world title. The season was marked by two very serious accidents, in which Giles Villeneuve lost his life in qualifying for the Belgian Grand Prix and Riccardo Paletti at the start of the Canadian Grand Prix. Although Ferrari had the strongest car it was very unlucky to lose its drivers during the season: Villeneuve and Didier Pironi who in Germany had an accident that forced him into wheelchairs. Rosberg with the victory in Switzerland and many second places managed to win the world title.